Eclectic Institute kava kava tincture is a great option for people who wan the calming benefits of kava without the trouble of making drinks. 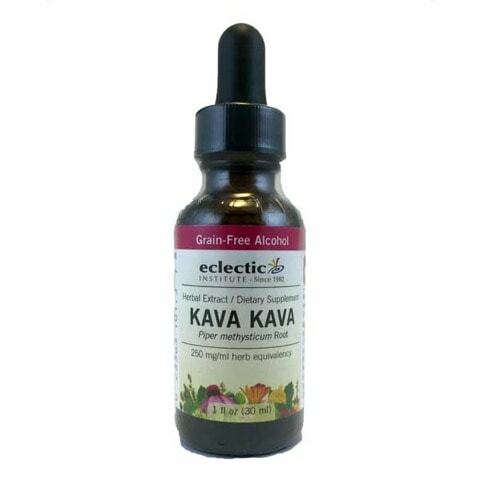 This Kava Kava Tincture from Eclectic Institute contains organic, 4:1 Kava Kava extract in a 1oz tincture bottle. Eclectic Institute has been making herbal products for over 35 years and we’re sure that you’ll love this Kava kava tincture. This kava tincture contains a surprisingly potent dose of kavalactone extract and is perfect for busy people who want to enjoy the benefits of kava without the trouble of making drinks. Suggested Use: Shake well before use. Take 15-30 drops up to 3 times per day. Drops can be consumed directly or diluted in 5oz of water.